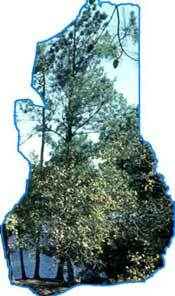 The eastern Texas Pineywoods supports more species of woodpeckers than any other region of the state. Currently, eight species of this unique family of birds exist in the Pineywoods. The Ivory-billed woodpecker once lived in eastern Texas, bringing the list up to nine. 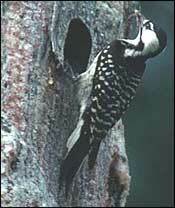 In general, woodpeckers require older trees and snags (dead trees) for feeding and nesting. Conservation of our mature forests and urban woodlots will ensure habitat for these important birds, as well as other species of wildlife dependent on their cavities. Each species photo and caption underneath links to line art drawings of both the male and female of each bird species. 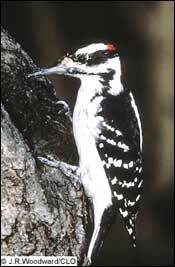 An almost robin-sized (9 1/4") black and white woodpecker with a white back and a fairly long bill. Uncommon in both open and dense woods, especially along the edges. 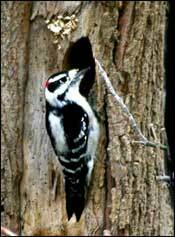 A sparrow-sized (6 3/4") woodpecker that is distinguished from the identical Hairy Woodpecker by its smaller size and shorter bill. Very common in suburbs, orchards, parks and woods. 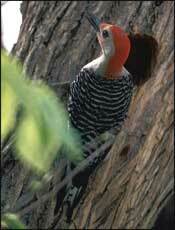 This endangered woodpecker is found in old, open pine forests. Creates nest cavities in living pine trees. Holes for pine resin to ooze are created in cavity trees to prevent snakes from climbing the tree. Males have a small red patch of feathers located near the ear (or cockade), which is rarely seen in thefield. Also called RCW, this species is about the size of an eastern bluebird (8 1/2"). A large, jay-sized (12 1/2") brownish woodpecker with a white rump and flashes of yellow in wings and tail. 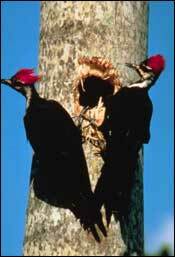 Nests in large trees in open forests, parks, and suburban areas. Spends much of its time searching for food on the ground. Prefers hardwood forests and lawns in the fall and winter. 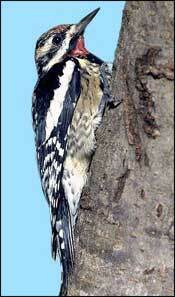 A common, but quiet bluebird-sized (8 1/2") woodpecker that drills horizontal rows of small holes in live trees. Found in pine and hardwood forests, as well as in parks, yards, and gardens. A winter resident, this species is not here in the summer. 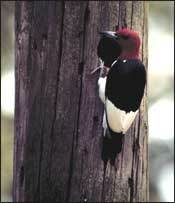 A robin-sized (9 1/4") black and white woodpecker with an entire red head. Found in the spring and summer in open forests, such as golf courses, parks, and farms. In winter, can be found in bottomland hardwoods in search of acorns. Young birds have gray heads in fall and winter, acquiring the red by spring. 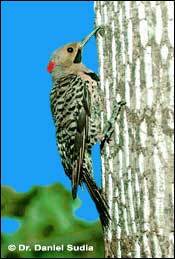 This robin-sized (9 1/4") woodpecker is the most common and widespread woodpecker in this region. Found in all types of forests, as well as suburbs and parks. The name is misleading since the small red belly patch is rarely seen. A large (16 1/2"), noisy, crow-sized black woodpecker with white neck stripes and chin. The prominent red crest and white under-wing linings aid in identification. 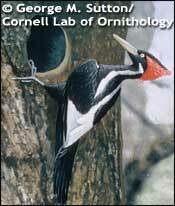 Prefers extensive forests and mature trees for nesting, but is also found in smaller woodlots, yards and parks. Colloquial names include: Indian hen, log-god or by-god.